Earlier this week I discussed the history of bonus expensing, which is a provision that has been passed on a temporary basis off and on since 2002. Bonus expensing allows businesses to immediately deduct (expense) 50 percent of the cost of equipment and software, as opposed to the usual treatment that requires businesses to delay these deductions for years or decades according to a complicated system of depreciation. Full expensing of all investment is ideal for economic growth, and bonus expensing takes a big step in that direction. Bonus expensing applies to all business equipment and software, and business structures that are normally written-off over 20 years or less. About 60 percent of business structures are normally written-off over 39 years, so they do not get bonus. During the time that bonus expensing has been in place, business investment in equipment and software has far out-paced investment in structures. Investment in structures has been positively anemic, flat-lining over the last year and still lower than it was 14 years ago, in real terms. Investment in equipment and software, in contrast, is nearly at an all-time high, again in real terms. The quasi-permanence of bonus expensing has apparently led businesses to count on it to some degree, figure out how it affects their bottom-line, and invest accordingly. Certainly there are other factors involved, but bonus expensing seems to have boosted investment in equipment and software in particular. So why do we need bonus expensing if business investment in equipment and software is doing so well? Actually, it is not doing well by historical comparisons. It’s just that business investment in structures is doing even worse. 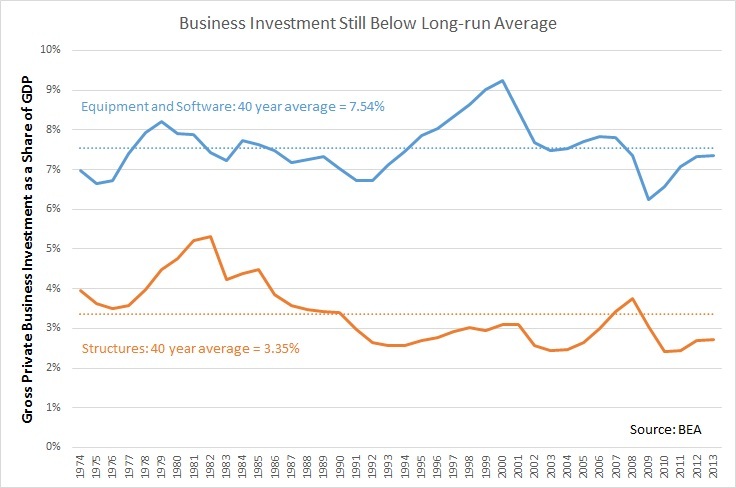 The chart below shows business investment as a share of GDP, both investment in structures and investment in equipment and software, since 1974 (roughly when software investment first became significant). Both forms of investment are lower than their long-run averages. As of 2013, business investment in structures is 2.72 percent of GDP, which is well below the 40 year average of 3.35 percent. Business investment in equipment and software is 7.35 percent of GDP, which is also below the 40 year average of 7.54 percent. The short-fall in equipment and software is to some degree masked by the long-term evolution of the economy towards more high-tech sectors, which is a function of technology more than tax policy. That is, there is an underlying trend higher, meaning investment in equipment and software should under normal conditions be above the 40 year average, but instead it is still below average. Investment in structures and equipment and software are the two major forms of investment, and both have yet to recover to average levels even though we are 5 years into an economic recovery. As well, the U.S. has very low levels of investment relative to other developed countries. The low levels of investment mean fewer offices, factories, equipment and software for American workers, which means less productivity. Slow productivity growth goes hand in hand with slow wage growth and slow job growth, which is why American workers have lost ground relative to workers in other countries. That’s why all forms of investment need tax relief, preferably on a permanent basis. The most direct way to lower the tax burden on investment is expensing, followed by lowering the tax rate on business income.